Time to put on those fuzzy socks and snuggle up in front of a blazing fire with some hot tea or chocolate because Winter is here! With all your winter clothes already sorted, aired and adequately restacked, it’s time to think about getting some snuggly cozy throws and blankets to help you enjoy the chilly winter with all its mirth and merriment! Here is a comprehensive guide to help you pick out the right blanket / throw for winter and cold weather. Depending on the user’s personal preferences and needs, there exist a variety of different types of throws and blankets easily available online! The best way to choose the right one is to have a comprehensive understanding of how the blanket or throw will be used. For instance, if you are looking for a blanket or throw to use all year round, then a single layered one would make a better choice. Compared to single layered throws and blankets, the reversible ones are a bit heavier and much warmer. However, their best feature is the ability to take them over you from either side up. User’s don’t have to worry about which side is the right side up as both sides work. This allows for the manufacturing of reversible throws and blankets with different colored sides so that you can enjoy varying colors by matching with the décor around. Furthermore, both sides can be made from the same material such as polyester microfiber or can vary with one side that is cotton as well. Single layered throws and blankets are lightweight and comparatively thinner in nature to their dual sided counterparts. 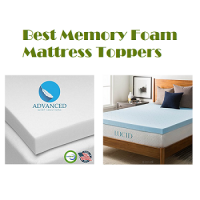 They are made from one material which is usually polyester microfiber due to its close-knit weave, hypoallergenic properties, flexibility and overall soft luxuries feel. Majority of these blankets are made from fleece which is extremely durable and easy to maintain as well. These blankets are also great to use around the year because they are not too heavy in construction. To enhance the overall look of the blankets or throws, some have prints on them. The best printing is done on polyester microfiber blankets and throws as the thread is weaved closely and the print stands out without looking scattered. Furthermore, this material can hold steadfast colors which helps retain the prints for longer. Some of the common prints found in these type of blankets and throws include snowflakes, webbed designs, geometrical designs among others. Some of the most beautiful throws and blankets incorporate knitted designs that not only add a soft touch to the blanket but also look elegant. One of the most coming kinds of knitting found in blankets and throws in the cable knit design which is embedded in the blanket and add a big of heaviness and sturdiness to the blanket overall. Blankets and throws that incorporate reversible cable knitting designs are easy to fold and can be taken over from both sides. Compared to duvets, blankets and throws are more versatile in nature because they allow for room to be used in multiple settings such as putting over a couch or chair while duvets are limited to the beds only. Blankets and throws don’t require users to buy additional covers for them as they are manufactured to look and feel great on their own. Majority blankets and throws can be used interchangeably and hence this increases their utility as you can use them in number of settings. Unlike duvets, throws and blankets can be easily stored away as they don’t take too much space when folded up. One of the most important features to consider when investing in a blanket or throw for the winter season is the fabric used in the making of either. Some of the most common fabrics employed are fleece, cotton and wool. While wool blankets are more expensive than the others, they are also considered the warmest as well. However, for people allergic to pure wool, this is not a good option to invest in. Fleece and cotton are common affordable options available as well. Compared to cotton, fleece is sturdier in nature and wrinkle resistant however cotton is more breathable and not susceptible to leaving behind lint or piling in the long run. Another important feature to consider is the overall size of the blanket and throw. This is important because it will further help decide their utility as well. There are several different sizes and colors available in blankets and throws and these may vary according to the fabric used in their making. Some manufacturers may also slightly increase the general size of a blanket or throw made from cotton to account for any shrinking that may occur in the initial washes. When it comes to taking care of your blanket and throw it is important that you look for one that is easy to maintain and does not come with additional overhead costs associated with dry cleaning. Although some fleece blankets and throws would recommend dry cleaning, it is not a feasible option for everyone. 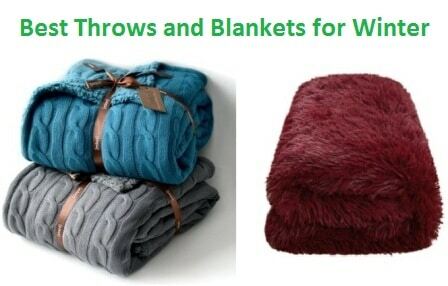 Blankets and throws that can be easily washed in a washing machine with cold water and tumble dried on a low setting are the most common and convenient ones for majority people. Depending on your personal preferences and the place where you will be putting the blanket and throw, one can choose a design of their choice. Some blankets and throws have a knitted design while others are printed or left plain as well. The knitted ones are commonly found in the reversible blankets and reverse knitting allows for using the blanket from either side. The printed designs are commonly found in fleece blankets and throws because the weave used in the making of fleece is close and tight which allows for easy printing and can hold colors fast. Moreover, knitted ones are also sometimes a bit costlier than the printed ones. The plain blankets and throws enhance the fabric’s own individual look. It is always a good idea to have vision regarding the utility of the throw and blanket that is being bought. Keeping in mind how and where they will be used helps make a choice regarding which kind to buy. Majority blankets and throws have a multipurpose utility, which means that they are not limited to being used in a single setting and can be put across a variety. This includes taking them on camping trips, keeping them in storage for over night guests, draping them across your favorite sofa or simply using them to keep your warm through the night. Perhaps one of the most important aspects to consider when purchasing a throw or blanket is whether to get a single sided one or a reversible one. The reversible ones are generally thicker and incorporate two different or even the same material on either side. These can be flipped over and used from both sides easily. One the other hand, the single sided ones are made from a single fabric and have properly defined right and wrong side. These are also thinner and usually used all year round. The Cable Knit Sherpa Oversized Throw Reversible Blanket adds a comfortable and sweet look to any room’s décor. Available in a three different pastel colors ranging from off white to teal and grey, the blanket works well as a great holiday present! The medium weight blanket with a stylish cable knit design provides a soft texture for the users even when the blanket is used in reverse. The Cable Knit Sherpa Oversized Throw Reversible Blanket complements any décor and gives a soft feel to any environment the user wishes to use it in. Made from a combination of cotton, acrylic and polyester, the material is breathable, soft and extremely durable. When it comes to taking care of the Cable Knit Sherpa Oversized Throw Reversible Blanket, users can easily machine wash this blanket and subsequently put it in the tumbler for fast drying. The blanket is not susceptible to shrinking and washes up well in medium warm water. Perhaps one of the best features of the Cable Knit Sherpa Oversized Throw Reversible Blanket is that it is double lined which means that both sides provide a warm and soft texture for the user. Made from a combination of cotton, acrylic and polyester, the reversible blanket provides a warm fluffy feel. The cable knit design and reversible features of the Cable Knit Sherpa Oversized Throw Reversible Blanket allow users to put it over in any way. Does not shrink even when put in the washing machine to wash. The extra-large size of the blanket makes it a cozy and comfortable option even when snuggling on the sofa. Some users complained about a strong chemical smell that resides within the blanket the first time it is unpacked. Looking for a cozy and warm reversible blanket in solid colors? Well with the Premium Reversible Berber and Sculpted Velvet Plush Luxury Blanket you will be able to enjoy your winters in the cozy and comfortable manner! The Premium Reversible Berber and Sculpted Velvet Plush Luxury Blanket is a high-quality blanket made from 500 GSM webbing! The microfiber polyester fabric used in the making of the blanket is extremely durable because of the close-knit webbing and extremely comfortable to use as they are very soft. They are naturally hypoallergenic in nature and do not allow dust mites and mold to settle in. The durable stitching and structure of the Premium Reversible Berber and Sculpted Velvet Plush Luxury Blanket ensure longevity! The blanket can be easily washed in a washing machine without shrinking or getting torn. Its also pill resistant which means that even after numerous washes the blanket will still maintain its original look! The Premium Reversible Berber and Sculpted Velvet Plush Luxury Blanketis the perfect winter blanket as it helps users stay warm and toasty! On one side the blanket provides a silky-smooth velvet feel while the other side is having a soft and cozy texture. The plush looking blanket can be used in several settings and even makes for a great holiday giveaway. The 500 GSm microfiber polyester properties ensure that the blanket is wrinkle and abrasion resistant. The Premium Reversible Berber and Sculpted Velvet Plush Luxury Blanket can easily fit several different sized beds without lacking space. 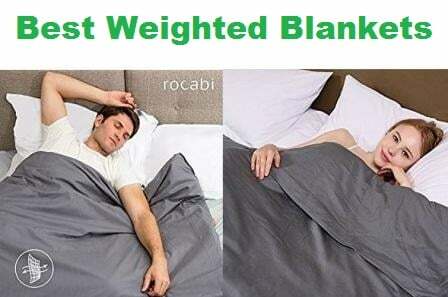 The blanket is lightweight and will not feel like it is weighing down on the individual. Some users complained that the blanket creates a lot of static electricity especially in dry weather. Light weight and cozy, the Sonoro Kate Fleece Blanket is the perfect snuggling blanket for couches, sofas, beds and even chairs! The warm and soft fleece material will help keep you cozy through the cold winters with a soft and comfortable feeling! Compared to wool blankets, the Sonoro Kate Fleece Blanket is extremely lightweight and quite affordable. Furthermore, fleece is generally a breathable yet soothing and insulating material that helps keep the user warm and cozy during the harsh winter weather! 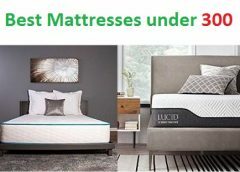 Also, it is very durable and ecologically friendly which means you will not have to worry about replacing the blanket every now and then. Whether you are looking for a blanket for your couch, sofa, chair or even bed, the Sonoro Kate Fleece Blanket Soft Warm Fuzzy Plush Queen can be put on any of these pieces of furniture without being overly dependent on the season. Placed in any setting and surrounding, the blanket proves to be a comfortable and cozy addition that not just feels nice but also looks gorgeous! With the Sonoro Kate Fleece Blanket Soft Warm Fuzzy Plush Queen, the user doesn’t have to worry about taking any extra measures to maintain the blanket. 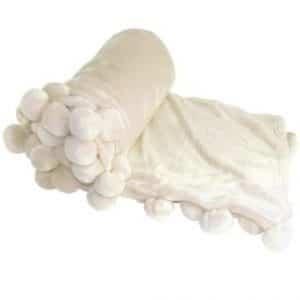 Its durable properties allow users to easily machine wash in cold water and subsequently tumble dry it on a low sensitive setting to help maintain the softness of the blanket for longer periods. The fleece material doesn’t shed even when machine washed in cold water and tumble dried on low setting. The plush fleece blanket is not season dependent and is made with versatility in mind. It is pill and abrasion resistant which means that the blanket will last through many winters to come! Some users complained about the blanket leaving lint on subsequent clothing when washed together. An all-rounder in all aspects, the Sherpa Throw Luxury Blanket Navy Blue Twin Size 60″x80″ Reversible Fuzzy Microfiber All Season Blanket is the perfect throw for your sofas, chairs and even bed! The comfortable dual sides allow for coziness and comfort! 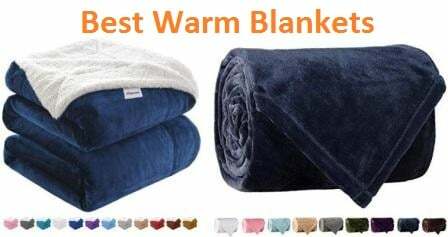 The reversible properties of the Sherpa Throw Luxury Blanket Navy Blue Twin Size 60″x80″ Reversible Fuzzy Microfiber All Season Blanket make it one of the coziest blankets found online. One side of the blanket is made from 220 GSM flannel while the other side is 280 GSM. Combined, the material is lightweight and comfortable! Furthermore, the decorative knit trim edges give it a pretty look as well. 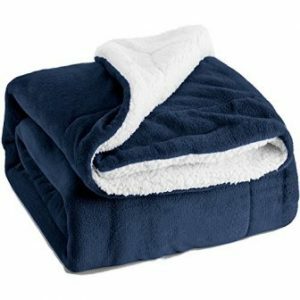 The Sherpa Throw Luxury Blanket Navy Blue Twin Size 60″x80″ Reversible Fuzzy Microfiber All Season Blanket is processed against shrinking and is very easy to maintain. The material is also wrinkle free and abrasion resistant which means that it has a good long life. Users can easy machine wash with cold water and tumble dry on a low setting without it shrinking. 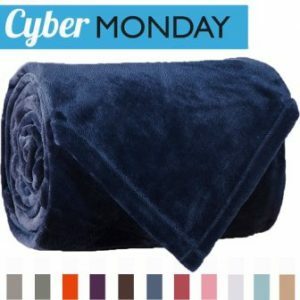 Made from a combination of 220 and 280 GSM 100 microfiber polyester material, Sherpa Throw Luxury Blanket Navy Blue Twin Size 60″x80″ Reversible Fuzzy Microfiber All Season Blanket is the perfect throw over for the chilly winter season! The microfiber material is much more affordable than cotton and also less breathable which makes it warm and cozy. 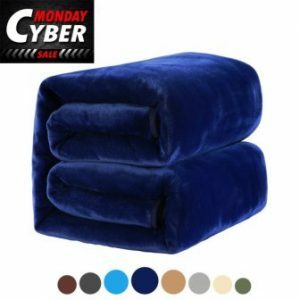 The dual sided Sherpa Throw Luxury Blanket Navy Blue Twin Size 60″x80″ Reversible Fuzzy Microfiber All Season Blanket is as soft and warm as wool. The blanket can merge in any surrounding with the help of the many colors that it is available in. The microfiber used is naturally hypoallergenic in nature which means that users with sensitive skin or allergies can use it safely. Some users were not satisfied with the overall quality of the blanket and complained about loose strings and left behind lint. Looking for an elegant yet cozy blanket? well with the Utopia bedding 100% Premium Woven Cotton Blanket you get both at an optimum price! The dobby weave with waffle square pattern enhance the softness of the cotton and make it more cozy and comfortable especially during the harsh winter season. Made from 100% premium woven cotton, the Utopia bedding 100% Premium Woven Cotton Blanket, it not only breathable but extremely durable and robust in nature. It weave is sturdy and will not come apart even after a couple of washing cycles. Furthermore, it is not very heavy and will not weigh down on the user unnecessarily. This 100% cotton premium weave blanket is the perfect addition to your bed, sofa and even chair! The dobby weave with waffle square pattern gives it a soft and elegant touch and enhances its overall look. The Utopia bedding 100% Premium Woven Cotton Blanket will only further enhance the overall look of the environment that you place it in. The Utopia bedding 100% Premium Woven Cotton Blanketcan easily be washed in the washing machine and tumble dried. The material is 100% cotton so there is a risk of a little shrinking after the first wash, but the manufacturers have accounted for this by increasing the overall size of the blanket so that even when it shrinks a bit after the first wash it still fits your bed easily. The blanket is larger than the general king size dimensions to account for early onset shrinking due to washing. The medium to light weight is adequate for all seasons all year round. The cotton fabric gets softer with every wash and dries up fairly quickly than other materials. The cotton material is susceptible to wrinkling and may feel harsher to the user’s skin in the initial days. Luxury at its best, the Flannel Fleece Luxury Blanket is the perfect throw blanket for the chilly winters! Its light to medium weight makes it a comfortable option to drape over yourself while snuggling on a couch or in bed! Made from 100% polyester microfiber material, the Flannel Fleece Luxury Blanket is super soft and cozy! The microfiber properties of the blanket ensure longevity and less breathability which makes the blanket a warm and cozy option for the harsh winters. Its close knit weave gives it a smooth and soft surface which feels luxurious to the user’s skin. Depending on the users’ usage, the Flannel Fleece Luxury Blanket can be easily kept in several different places without looking out of context. The beautiful fleece blanket looks gorgeous as a throw over on couches and chairs but is as cozy and comfortable if used as a blanket on the bed as well. The Flannel Fleece Luxury Blanket is not only shrink resistant but also easy to clean and manage. Users can easily wash the blanket in the washing machine with cold water and tumble dry it on a low setting. The idea is to avoid direct heating so that the material doesn’t get affected and hence can last longer. Microfiber fabric has a long life because it is tightly woven together hence making it abrasion resistant as well. Its wrinkle and fade resistant hence the blanket holds on to its colors throughout the time that you have it with you. Compared to cotton, microfiber material is much softer and cheaper in price. Some users complained about the blanket leaving behind fibers and pilling over. The regal and plush looking MEROUS Soft Queen Fleece Bed Blanket makes for a great gift for the holiday season! It looks gorgeous in several settings and has a comfortable and cozy texture to secure in the warmth. Made from 100% 330 GSM microfiber polyester fabric, the MEROUS Soft Queen Fleece Bed Blanket is extremely soft, comfortable and naturally hypoallergenic in nature. The material is naturally hypoallergenic in nature which means that there is no chance of mold or dust mites taking residence and causing allergic reactions. The makers of the MEROUS Soft Queen Fleece Bed Blanket give easy and convenient instructions for maintaining the blanket. It can be easily washed with cold water in the washing machine and tumble dried on a low setting. Furthermore, it doesn’t require any bleaching and should be kept away from direct heat. The MEROUS Soft Queen Fleece Bed Blanket is a high-quality blanket that is wrinkle and abrasion resistant! The microfiber properties of this blanket make it sturdy and free from shedding, pilling and even wrinkling. Its soft and light to medium weight properties make it a great option to use all year round. Unlike cotton material, the blanket is not as breathable, but this helps secure the warmth and add to the overall coziness. The wrinkle free properties of the blanket make it easy to maintain as it takes back its original shape after washing. The blanket is lightweight and easy to store away in the warm season when not in use. The material may cause piling a lint accumulation in the washing machine especially during the initial washes. Looking for a cozy yet easy to maintain blanket? well with the Queen Polar-Fleece Thermal Grey blanket you will be enveloped in luxurious softness and warmth that is an ideal investment for the chilly winters. 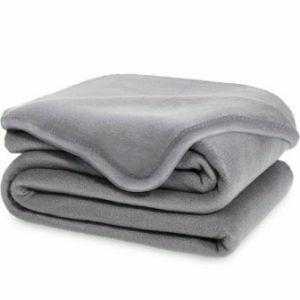 When it comes to maintaining the Queen Polar-Fleece Thermal Grey blanket, the manufacturers instruct users to wash it in a gentle and cold-water cycle with low temperature tumble. It is also recommended that you wash it separately so that the material doesn’t get too stretched which can ultimately lead to abrasion. The polar fleece fabric is made especially from synthetic wool fibers which makes the Queen Polar-Fleece Thermal Grey blanket a great option to have during the cold winters. It is known as one of the softest yet warmest of fabrics that work well especially in cold weather. 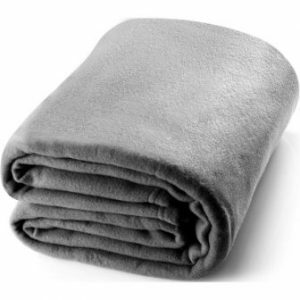 The Queen Polar-Fleece Thermal Grey blanket is 100% polyester microfiber with 2-sided pile which means that micro fiber softness can be experienced by the user from both sides. The 250GSM fabric is not too heavy but keeps the users cozy and comfortable during usage. Furthermore, the close knit weave of the fabric allows for retention of warmth and also has a smooth silky feel to it. The blanket is wrinkle free even after getting washed which means you don’t have to worry about ironing it. The multipurpose properties of the blanket make it a great option to throw over your couch, bed or even reading chair. The synthetic wool fibers coupled with the polyester ones make this blanket hypoallergenic in nature which means that users with allergies will not have any difficulties. Fleece tends to generate static electricity which can also attract lint and piling. Looking for a super cozy and soft blanket to give you immense comfort through the cold winters? Well with the Napa Plush Cashmere Throw Blanket’ velvety touch you will be enveloped in a warm and cozy embrace! Made from high quality polyester microfiber material, the Napa Plush Cashmere Throw Blanket is reversible in nature. One side of the blanket features a soft and comforting fleece feel while the other side is very velvety to feel. The microfibers are not breathable in nature which means that the blanket is warm will work well through the chilly winters. The Napa Plush Cashmere Throw Blanket is made to last through the seasons and hence can be used not only for bedding but for couches, chairs and even sofas. The reversible blanket is available in several solid colors that can go well with numerous different decors. You can also take the blanket for camping trips or store it away for when you have overnight guests coming. The Napa Plush Cashmere Throw Blanket is known to last through the seasons without any abrasions or tears. The lightweight blanket does not wrinkle nor fade over the years after multiple washes. It can be easily used after washing without worrying about any shedding. 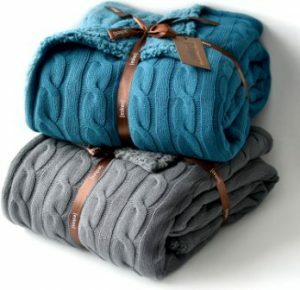 The Napa Plush Cashmere Throw Blanket makes for a wonderful present for multiple occasions. 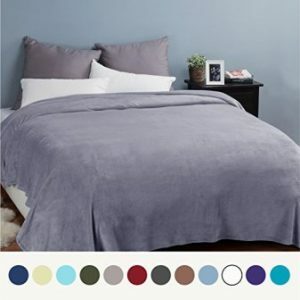 The blanket is easily available in many solid colors that do not fade away after numerous washes. The reversible nature of the blanket gives it a nice inviting feel that is good for multiple seasons. The blanket cannot be easily machine washed or tumble dried. User will have to hand wash it and lay flat to dry. Looking for something light and fuzzy? With the Premium Quality Super Soft Plush Throw Blanket, you get both without spending excessive amounts of money! The blanket is available in light pastel colors which can easily mix into several decors! Made from 100% polyester microfiber material, the Premium Quality Super Soft Plush Throw Blanket has one of the most comfortable and soft feels! 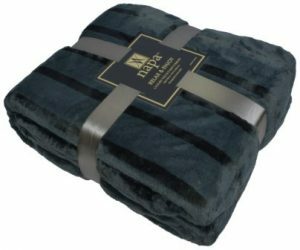 The blanket is warm because of the closely woven microfibers and at the same time extremely fuzzy hence providing the perfect winter feeling! When it comes to washing, the Premium Quality Super Soft Plush Throw Blanket can e easily washed in a washing machine with cold water and a soft cycle. This will help keep the blanket plush and fuzzy for longer. Similarly, you can also easily tumble dry on a low setting without worrying about shrinking. The Premium Quality Super Soft Plush Throw Blanketis the perfect addition to any area’s décor in your home! You can drape it over the chair or couch or even thrown it over the bed to give it a cozy feel! With this blanket you can get into the winter season celebrations without spending too much! The lightweight construction of the blanket allows users to easily store it away for when they have overnight guests. The high-quality construction of the blanket makes it last longer through different seasons without any additional wear and tear. The blanket is available in pastel colors and three different sizes to match the user’s individual preferences. Some users were not satisfied with the blanket’s thickness and did not find it adequate to use as a blanket for the bed. Warm and fuzzy, the Shilucheng Fleece Soft Warm Fuzzy Plush Lightweight Throw is the perfect blanket to counter the cold chilly nights of winter! The blanket’s warm features work well against the cold however, it can easily be used in other seasons as well. 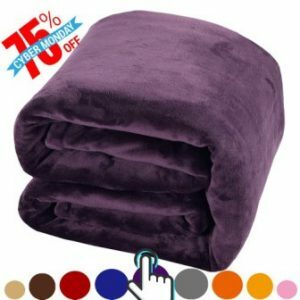 Made from high quality fine microfiber polyester material, the Shilucheng Fleece Soft Warm Fuzzy Plush Lightweight Throw is not only lightweight but also not very breathable. This allows for maximum amount of warmth get secured in hence keeping the user warm and cozy. Furthermore, the blanket is extremely lightweight and can be esily stored away when not in use. Whether you are looking for a blanket for your bed or a throw for your couch or favorite chair, the Shilucheng Fleece Soft Warm Fuzzy Plush Lightweight Throw’s multipurpose utility allows users to enjoy this blanket in many different scenarios and environments. You can also take this blanket for camping trips or even if you are planning on a backpacking trip! The Shilucheng Fleece Soft Warm Fuzzy Plush Lightweight Throw can be easily washed in a washing machine with cold water and subsequently tumble dried on a low setting. It is also recommended by the manufacturer that the users wash the blanket with other fleece materials or separately to avoid abrasion or unnecessary stretching. The microfiber material is naturally hypoallergenic in nature which means that the blanket will not accumulate dust mites or mold. The blanket has a very plush sleek look which goes well several different decors. Is available in many different sizes hence can be used for children’s beds as well. The blanket is not reversible and hence has a dominant side that gives it its actual look. Luxurious yet conventional, the Equinox Polar Fleece Blanket is the perfect lightweight fleece blanket for a variety of different settings ranging from unexpected houseguests to snuggling on the couch with your loved ones! Made from 100% pure 250GSM microfiber polyester fabric, the Equinox Polar Fleece Blanket is quite lightweight and soft enough to be used by individuals without feeling any excess weight pushing over them. The polyester fabric is abrasion, fade and shrink resistant as well. When it comes to washing, the Equinox Polar Fleece Blanket can be easily machine washed in cold water and put on a line to dry. Manufacturers advice against tumble drying as it can cause damage to the blanket. Furthermore, the blanket is not susceptible to shrinking either. The Equinox Polar Fleece Blanket employs a very practical design which makes it quite multipurpose in nature. The blanket can be taken for camping trips, or cuddling up on the sofa with your beloved. The large size of the blanket allows you to easily snuggle in with your kids to watch a movie as well. The blanket is lightweight and folds up to become a decent compact size which is great for storage for when you have guests coming to stay over. The polyester microfiber material of the blanket is naturally hypoallergenic in nature and is a good option for individuals with allergies. The blanket is large enough for a queen sized bed and at the same time durable enough to be taken on outdoor trips. Some users complained about the blanket being too stiff to gather up easily and taken over. The CaliTime Super Soft Blanket Throw is soft and gentle to the user’s skin. It’s tightly woven threads make it flexible, without wrinkling, and warm to last through the harsh winters!When it comes to maintenance, just through the blanket in the washing machine ad let it tumble dry on a low setting! Made from high quality polyester microfiber material, the CaliTime Super Soft Blanket Throw is super soft and has a comfortable and cozy feel. The microfibers are woven together closely and hence make it less breathable which helps contain the warmth for longer. Furthermore, compared to cotton, the material doesn’t wrinkle after washing. With the CaliTime Super Soft Blanket Throw the user doesn’t have to expend any extra efforts on washing and maintenance. The blanket throw can easily be washed in cold water in a washing machine without shrinkage. Moreover, the user has the option to either putting it out on the line to dry out or tumble drying through a low setting. The CaliTime Super Soft Blanket Throw can be used in a number of settings. Its versatile application allows users to throw it over a couch or chair, take it for camping trips, or even take it over as a blanket in the cold winters. The microfiber construction of the blanket ensures its sturdiness and longevity. The CaliTime Super Soft Blanket Throw is naturally hypoallergenic in nature and will not allow the accumulation of mold or dust mites. The blanket doesn’t require any additional care such as ironing or bleaching. Its lightweight allows for easily carrying it or storing it when not needed. The fleece material may shed a little in the initial few days but after washing with similar clothes the shedding decreases significantly. The BOON Pompom Bed Couch Throw Blankets is the epitome of durability and design! The blanket incorporates pom-pom balls in its design which enhances its overall look! Moreover, its microfiber construction ensures longevity and durability! Made from 100% polyester microfiber material, the BOON Pompom Bed Couch Throw Blankets is not only warm but extremely sturdy in construction. The microfibers are woven tightly to provide adequate warmth to last through the cold winter season and at the same time also enhance the softness and cozy feeling of the blanket overall. Unlike many other throws and blankets for the winter season, the BOON Pompom Bed Couch Throw Blankets have Pom Poms on two side. These add to the overall look of the blanket when it is draped over the bed or the couch. Furthermore, the Pom Pom balls add a bit of weight on the sides to help the blanket stay in place. The manufacturers of the BOON Pompom Bed Couch Throw Blankets recommend users to dry clean the blanket only to increase its lifespan and maintain its overall look. Furthermore, the blanket is said to get softer with every cleaning without causing piling, lint or wrinkles. Dry cleaning also helps the fabric retain its original shape and feel hence adding to its overall longevity. 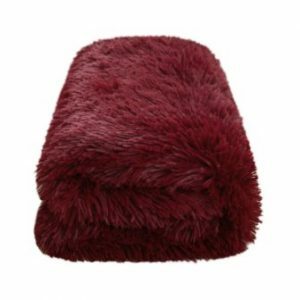 The pom-pom balls on the BOON Pompom Bed Couch Throw Blankets add to its overall design and look. By dry cleaning the blanket its overall life increases along with the general softness of the blanket. The microfiber construction of the blanket is hypoallergenic in nature and hence protects individuals from any kind of allergies. Dry cleaning wouldincrease the costs associated with the blanket’s maintenance and hence is not an affordable option for everyone. Looking for the perfect holiday season gift? 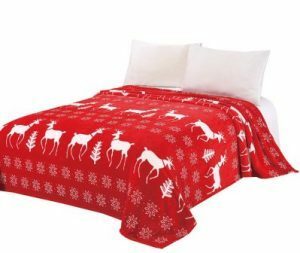 The CaliTime Super Soft Throw Blanket incorporates snowflakes and reindeers in its design hence making it a wonderful Christmas present or decoration for the winter season! The super soft CaliTime Super Soft Throw Blanket is made from high quality closely knit together polyester microfibers that help hold in the warmth and at the same time feel gentle to the user’s skin! The microfibers make it soft and flexible without causing wrinkles. At the same time, the close weave also makes the material quite sturdy hence abrasion resistant as well. Incorporating a beautiful holiday print, the CaliTime Super Soft Throw Blanket makes an ideal addition to any household to welcome the beginning of winter! The reindeers and snowflakes add to the festivity and make for a great holiday present as well! You can either put it across the bed or throw it over the couch for snuggling in front of a fire place. This blanket has a multipurpose utility to it. The CaliTime Super Soft Throw Blanket can be easily machine washed separately in cold water on a gentle cycle without requiring any additional chemical cleaners other than regular detergent. The user can choose to tumble dry the blanket on a low gentle setting on put it on the line for drying as well. Tumble drying will not cause the blanket to wrinkle hence will not require any additional efforts associated with ironing either. Makes a wonderful Christmas present because of the reindeers and snowflakes design. The hypoallergenic nature of the blanket protects users against allergies along with keeping the blanket free of dust mites and mold. The blanket might leave behind lint if washed with clothing of different material other than fleece. Winter is all about getting cozy and comfortable anywhere from your favorite couch to the chair and even the bed! Therefore, investing in the right blanket and throw becomes all the more important so you can enjoy the chilly weather without catching a cold!